We just returned from our Summer vacation in North Carolina. We did a ‘treasure hunting’ vacation up to Franklin. This is an area known for many Gem mines, where you can mine for Rubies, Sapphires, Emeralds, and variuos other stones, depending on the mine. We rented a 30 foot Class A Motorhome for the trip up. First time we have done that, and I must say, we had an AWESOME time of it. The kids said it was the best vacation we ever had, and they want to keep the motorhome. I was surprised to find driving the big, wide, long truck to be a pleasure, I loved it. It was so cool to be driving down the road, while everyone was comfortable and relaxed in their own space, watching TV or playing games, Tamara’s cooking stuff in the microwave. It’s the way to travel. 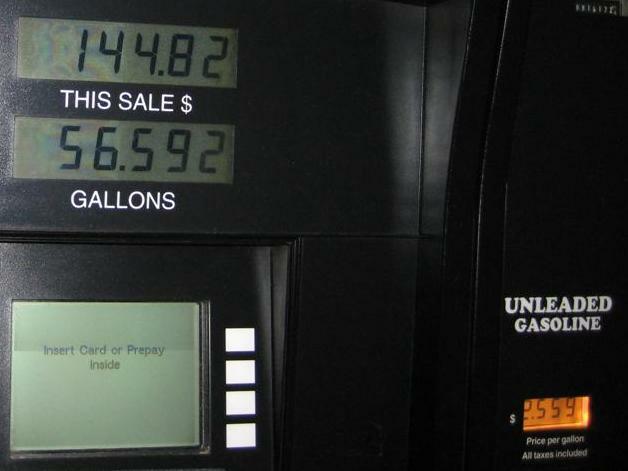 Of course you pay for that at the gas pump! See photo! We still have to gather our finds at the mines together and get a photo of them to put up. We mined(we found rubies, but we aren’t exactly rich from it), played in the local rivers, did some hiking, and plenty of shopping. Around camp we also had a river running by to play in, we fished, and did the campfires and cooking out. The best thing about the trip was that EVERYONE really had a good time. We all wished we could have stayed another week. On the way home, we were planning when we could do another RV trip. Maybe something at Christmas time. This entry was posted on Friday, August 17th, 2007 at 7:48 am	and is filed under Family. You can follow any responses to this entry through the RSS 2.0 feed. Both comments and pings are currently closed. Hey Dave, sounds like you guys had a great vacation. Your kids will remember that one forever. You mentioned that you were pacing a Wasatch. Are you still going out there? I am looking for someone to pace me from Brighton to the finish. I wasn’t sure what your plan was. I hope you guys are doing well. Tell Tamara hi for me. No, the guy that asked me to pace him decided not to run.